This silk patio dress by DKNY has become one of my summer staples. that would integrate perfectly into my summer wardrobe. I needed my 'clutch' to be on the large size too. and has enough room for everything I need for a night out. Here is our giveaway for the week! 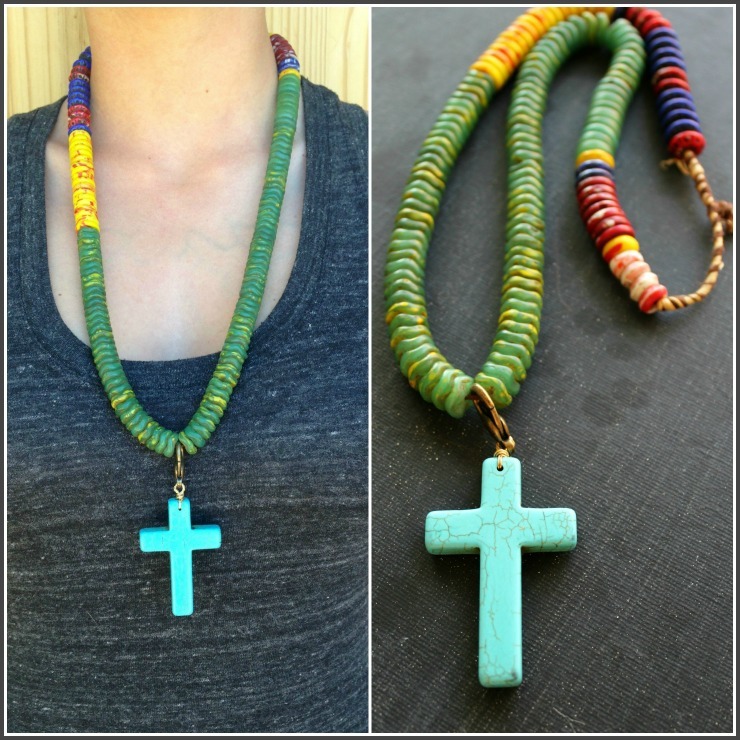 This mid-length necklace is created with African multi-color beads and a howlite cross drop with removable clasp. This is a preview of the pieces that will be up in the shop on Tuesday! This week's giveaway will be on Instagram. 1. Follow @tamerabeardsley on instagram and leave a comment on the photo (look for the photo that I have posted below). The giveaway will be open now through Saturday, August 17th at 6:00pm. A random winner will be selected using the Random Number Generator. One winner will be announced next Sunday, August 18th after 2:00pm. You will have 48 hours to claim the necklace before it is given to the second place winner! To enter, you must be 18+ and a US resident. Look for this picture on my instagram! for winning the Howlite Bracelet giveaway! Gorgeous photos and I love your whole style! Have a wonderful week, Tamera! So gorgeous, Tamera, from hat to toes. Love your new-vintage bag and your beautiful giveaway necklace too. Thanks for sharing with Visible Monday! You look absolutely beautiful in this perfectly styled outfit! What a gorgeous dress. 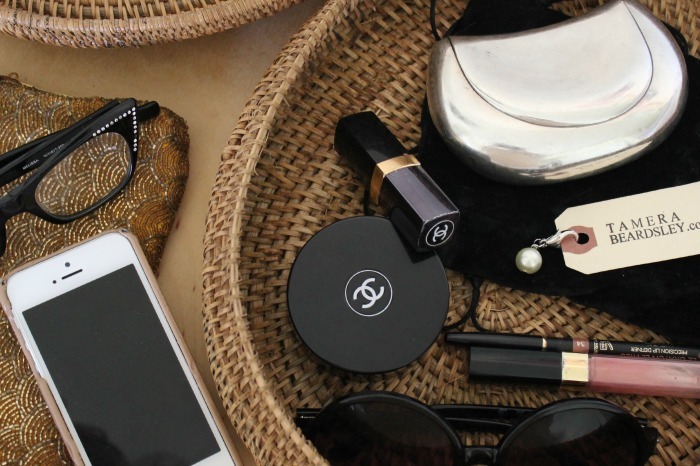 Fabulous clutch, what a great find! Your posts are always creative and beautiful. 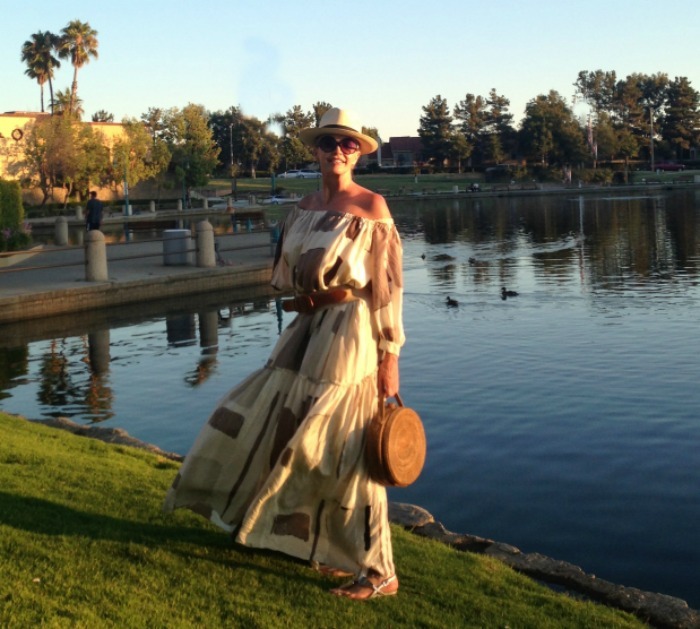 I love the beautiful dress and sandals, but the hat and bag make the outfit. The natural bag is fabulous. Your give away necklace is so gorgeous. Love the colors and the style. What a beautiful necklace and I love your new bag! You are such an incredibly talented woman. I love all of your gorgeous creations. Hello Tamera, I would comment anyway, of course, but the giveaway piece is just too fab not to enter. I will be toodling over to instagram shortly. You are an artist and your creations never cease to amaze me. Love this gorgeous piece. By the way-looks like I will be visiting family in Newport Beach the weekend of Oct. 11-13. Hoping you will be in town! Let me know your schedule lovely friend. What elegant and beautiful shots! 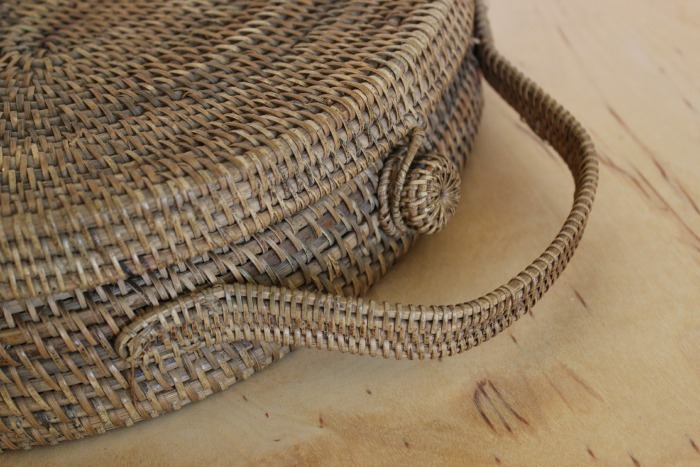 I popped in here to thank you for your sweet comment on my hat post, and was delighted to find such a stylish and noteworthy blog! And hey, a giveaway happening too! Gorgeous colors. Oh gosh... I haven't been to your blog in far too long, and when I read that you were giving something away I just had to come see what it was. OMG! Perfect necklace! Perfect! 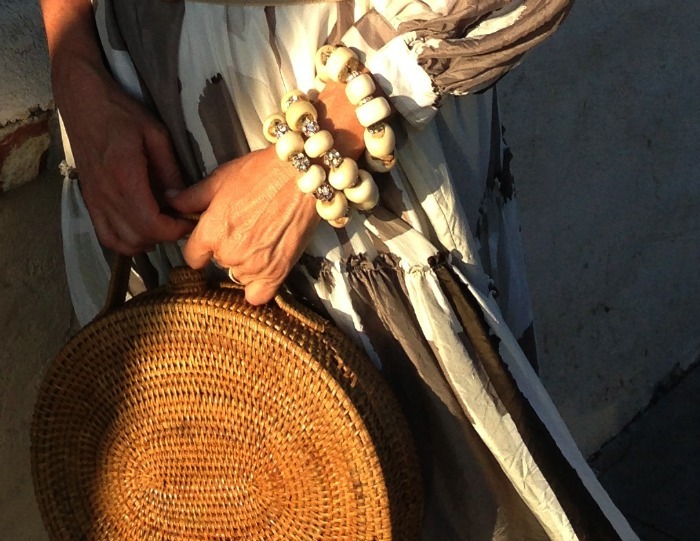 Tamara - The African multi-color beads would go perfect with my ethnic style! Sign me up. Wish me luck! Such beautiful colors in the picture. How elegant and stylish you look again, Tamera! Your styling is excellent and the photos are beautiful in the evening sun. wish I was half as talented! Love the dress and the new clutch! That is EXACTLY why I like vintage, too! I'm a long time follower but have never taken the time to comment. Sorry! I love your style and creativity - it is so inspiring. Your posts are always uplifting and refreshing and honest. Have a wonderful week and please accept me as an entrant for the beautiful necklace. I "liked" you on Facebook and I do like your style very much. The necklace is gorgeous. I just 'liked' your facebook page. Love the flowy maxi dress and the shoot is so pretty with the wind blowing. Lovely to meet another fashion blogger mommy. I love the hat with the dress. Great combination. 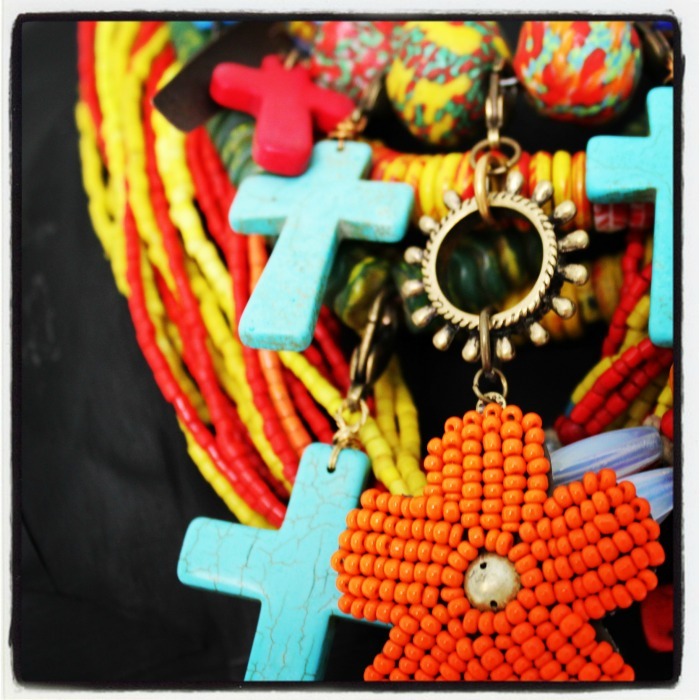 I love turquoise and crosses, so you see this necklace was made for me! 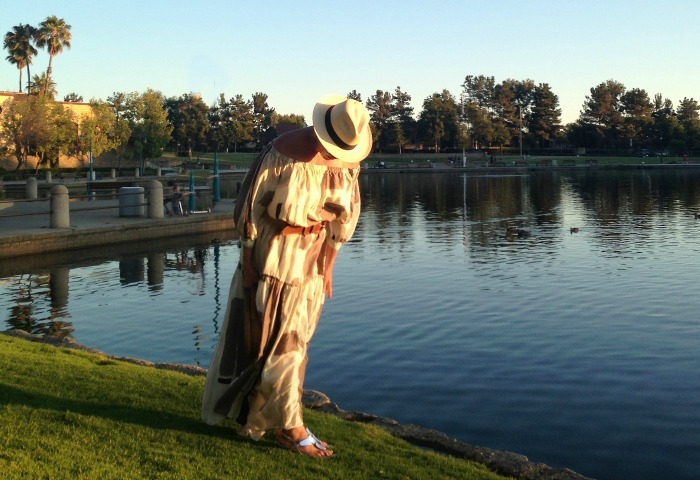 What a great story this assemblage of clothing tells, from the oh so feminine dress and the vintage - 20's? 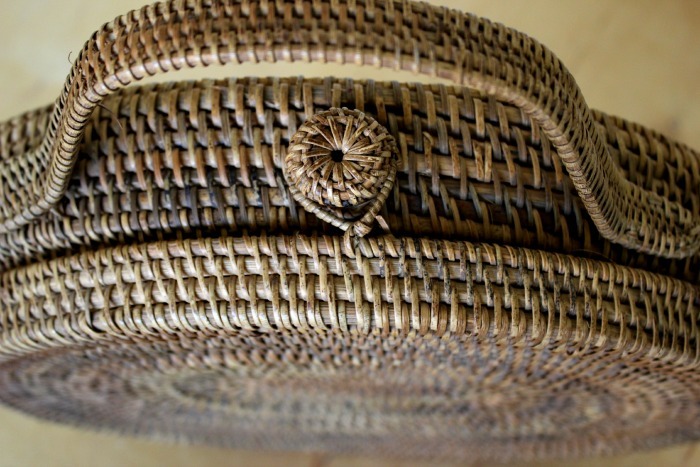 - bag, to the jaunty addition of a gentleman's panama. You are the style queen, Tamera. And I love the necklace give away. Please put my name in the bran tub! Hello, lovely Tamera! Pale neutrals, warm to cool, have such a gounded feel to them, don't you think? Such a beautiful, flowy dress just says summer. In the deepest, Lauren Bacall voice! The right shade of beige-tan-taupe is just so .... CLASSY! You haz it! You look gorgeous! I can't believe how much room the tote has! The purse is FAB and you are absolutely right - nobody else will be passing by with it!! That's what I ADORE about thrifting - the look I create is on trend BUT all my own!! 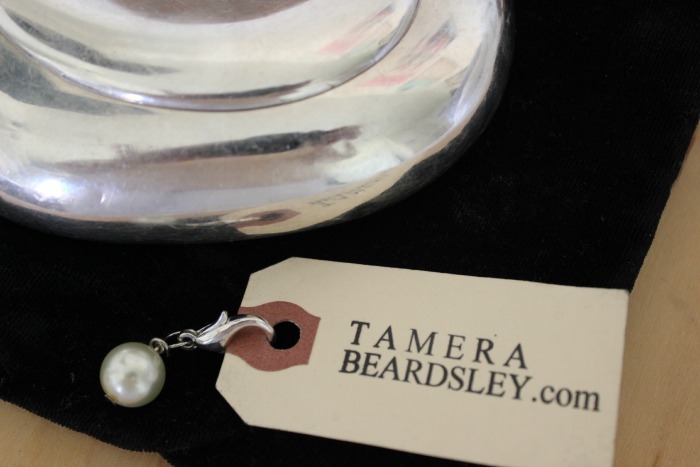 PS, I'd LOVE to win this FUN piece of Tamera Beardsley jewelry!! That maxi is simply stunning!